Home »Photography»Canon 7D Tips – DSLR or Camcorder for HD Video? Canon 7D Tips – DSLR or Camcorder for HD Video? 1. Image Quality. If your utmost concern is image quality, then the choice is easy. A DSLR is by far the winner in the image quality contest. Just look at the comparison of the sensors above. 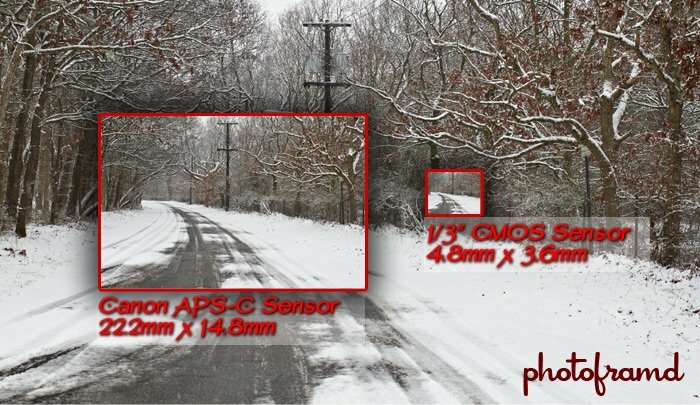 The Canon APS-C sensor is 22.2mm x 14.8mm while your typical 1/3″ CMOS Sensor is only 4.8mm x 3.6mm. Sure, both sensors can produce 1920 x 1080p Full HD Video, but the smaller 1/3″ CMOS sensor must interpolate the hell out of the image to stretch the image up to achieve it. Instead, the Canon APS-C is capable of capturing 5184 x 3456 pixels, well beyond the 1920 x 1080 HD video image size. The Canon image is actually reduced to the smaller image size. Reducing an image will always have better image fidelity and sharpness than expanding an image. Anyone that has fooled around with Photoshop can attest to that! Now, think about the size of the lens in both the DSLR and the camcorder. The optic on the DSLR is much bigger because it is designed to capture photographic images. Put a Pro lens on the front and you now have superior optics which can capture more light and produce sharper images. Think of DSLR video as really moving pictures. Lastly, think about image quality during low-light performance. The Canon 7D has dual DIGIC IV image chips processing the image at all times. Combine that big sensor with the big optic and processing horsepower and its no wonder why the Canon 7D was code-named the Lord of Darkness. 2. Autofocus. This factor can also be a deal breaker. If you need to have continuous autofocus, there is no choice but a camcorder. Camcorders were always designed to capture video. As a subject moves, camcorders can easily autofocus to keep them sharp. This is not true for DSLRs. AI Servo and AI Focus modes work for still photography not video. With the Canon 7D, you can force the camera to autofocus on a subject while recording video by pressing the shutter half way. But, this most likely will cause the camera to “hunt” for focus, fading out of focus before locking on the subject. If you have ever seen the elaborate rigs by Redrock Micro and Zacuto for the Canon 7D, they include something called a “focus puller” which makes it easy to manually focus the lens while shooting video. Now, in real world use, most scenes will be shot using one focus point. A change in focus will usually mean a cut-scene unless the camera is following the action. It is an easy work-around — autofocus on the subject, shoot the video, stop and recompose, autofocus again, start shooting video again. It’s more like shooting still pictures and it works! 3. Image stabilization. Both DSLRs and camcorders can handle jittery camera movements to a degree. With camcorders, the image stabilization is built into the video camera. It is also designed for movement while shooting video. DSLRs like the Canon 7D have image stabilization built into the lens, but not all lenses have IS (Image Stabilization). I have been using my 15-55mm IS EFS lens more and more over my favorite 24-70mm L lens just because of the added image stabilization. But, even this IS is not as good as the image stabilization built into most camcorders. Most DSLRs will stabilize horizontal and vertical movement (which would be most common problems for still photography.) Camcorders can also take into account the speed of camera movement during stabilization. Only Canon’s new Hybrid IS, available in the new 100mm Macro L lens, can also compensate for acceleration speed. Considering Canon just announced the update for their 70-200mm f/2.8 IS L lens (one of their biggest sellers), it will be very interesting to see how the new IS lens performs for video. So there you have it. Do you want to shoot HD video with a DSLR or with a camcorder? Consider these three factors and decide for yourself. But, if Image Quality is the most important factor, chances are you will decide on a DLSR like the Canon 7D. For sample video shot with the Canon 7D, please take a look a my YouTube Channel and my Vimeo Channel. I think another big factor is the 12 minute time limit on the dslr. there are some events that people like to shot continuously, like there kids play or a senators speech. It might look like the T2i might be able to get around that with a different card formating. Actually Canon 7D has two different limits programmed in. The 7D will end a file automatically if the file size hits 4 GB or 30 minutes whichever comes first. That works out to 12 minutes of video at 1920x1080p@24fps, but it’s almost 30 minutes at 640×480. The better video presentations always splice together short clips ranging from 4-seconds to 1-minute. Just call it Short-Attention-Span Theater. Thanks! AF problems with the 7D?? Yes, I have a few articles on that. Take a look at this one on Customizing the AF. It should be noted that the Panasonic GH1 can autofocus while shooting video. I find the stabilization to be the more frustrating factor. I want it in the body because it just makes lenses more expensive and many lenses I use do not have a VR equivalent, especially for shorter focal lengths and large apertures. I think the first DSLR to do autofocus + in-body stabilization will be the one I run to. As a Nikon guy, I’m hoping it’s the D90 followup, but that’s wishful thinking. The Four/Thirds cameras love to buck trends. The new Sony Alpha NEX-5 can also autofocus in video mode and shoots at 1080i. Is there a way to bypass the 4GB block and record 29 minutes of HD video with a 7D? Unfortunately no. The real gauge is the 4GB file size or 30minutes of video whichever comes first. You can increase the number of minutes by dropping to a lower resolution, but that’s it. HD will yield 12 minutes at 1920×1080 or 20 minutes at 1280×720. When the 7D completes a file, there will be a pause in recording while the file is finalized. There is no way around that either. But, you can “hide” these pauses fairly easily by editing the video and splicing together the groups. Just avoid the obvious problems with cut-off songs or speeches. What about depth of field? That’s one shortcoming of my camcorder that bugs me a lot. Seems with a DSLR you have this option available. Is this correct? Very good point! But, with Canon and other manufacturer’s working on true hybrid camcorders (that combine the best of DSLR in a camcorder body), this may not be true for long. Nice article… I was going through a dilemma…DSLR with 12 minutes or a handycam .. I like manual rim style focus and zoom… but that makes you ocupy with the “available hands”!! !… One more problem I have been told by many that DSLRs cannot handle long times due to heavy heating in sensors….Any idea…? Sensor overheating is a problem. After all, DSLRs were designed to still photography. Motion photography is an add-on. I have read reports about Nikons and even Canon 5D Mark IIs overheating. But, I have never had that problem with the Canon 7D. The 7D was Canon’s first camera really designed for both still AND video. If you look at my video for the recent Halloween Parade in NYC, I filmed five hours of video fairly continuously without a problem. Also saw the Halloween event video… Does 7D has a light infront for video..? what about the autofocus and stabilisation which you have mentioned earlier? Well, both Sony and Canon just released true camcorders built around a larger sensor (like the APS-C in the 7D). Sony’s NEX-VG10 is a bargain at $1700. Canon’s C300 is aimed at the Hollywood/Indie crowd and is priced at $20,000. While shooting video with a DSLR like the Canon 7D does lack the ease of the camcorder. But, the image quality is stellar and worth the extra effort. (i) Autofocus have a problem, that when anything comes in between the frames, rather than the subject, it defocus, and hence posse problems. So let us switch over to manual focus. your left hand is now engegd with the focus ring..
(ii) Now you want the zoom to be adjusted for better controls manual zoom is again preferred for the shot and then your right hand ( that is all left) is also engaged. Also what is focus puller…? The 7D does not have continuous autofocus when shooting video. The focus will lock when you start recording video and will not change unless you manually adjust the focus. My method is to lock autofocus first, start shooting video, stop shooting video, re-adjust autofocus and then start shooting video again. Once you get used to working like this, it is very easy. You can manually zoom while recording video. But, it is better to zoom into the subject first and lock autofocus to be sure it is as sharp as possible. Next, zoom out and start shooting video (do NOT readjust the focus). Now, when you manually zoom in, the video will be sharp. You can pan, adjust angles, etc. Just think of each as a separate video sequence. Even more info in my ebook! As for a focus puller, that is a person who manually adjust the camera focus (usually using a follow focus). You can spend anywhere from a few $100 to $1000 for a follow focus. Otherwise, you can try a DIY Follow Focus solution for under $10. Could you please clarify whether 7D or 550D or 60D? which shall be the best..I would be interested in HD video..the specs seem same for all the three.. and so I presume quality shall be similar…then what is the difference… and also huge price difference.. Please help me out.. 60D is having flippable LCD so good for angles…also I am slightly confused as there is no demo piece available in our place at canon store..Whether the focus can be manual ring operated.. and will work with a zoom..?? For HD video recording, the 7D, 60D and Rebel T3i should be very similar. They are all DSLRs with video recording capability. None have built-in image stabilization nor auto-focus while shooting video like a real camcorder. The big difference is the materials used in the camera body as well as other features for still photography. The 7D is Canon’s top of the line crop-sensor camera.